Founded by Colonel Light in 1836, Rapid Bay is a little gem. A white sandy beach, crystal clear water, predominantly offshore winds, and a historic jetty that is a home to South Australia's marine emblem, the leafy seadragon. For most people the beach scenery ends there, but for the lucky few who have booked a sea kayaking trip the adventure has only just begun. 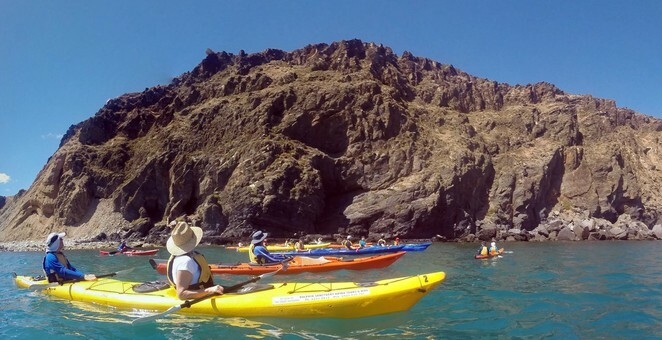 Adventure Kayaking SA, a family company featuring Phil, Andrew, Dave and Pippa, run sea kayaking tours exploring Rapid Bay and some of South Australia's oldest, most majestic and rugged coastline. Just to the north of the Caravan Park is a small boatramp where a gaggle of kayaks are gathered in wait of South Australia's next adventurers. Kayaks are chosen, safety instructions and safety vests are issued, while the sea kayaker's spray skirt is hitched high causing the odd chuckle. On board and we head south to South Australia's only purpose built recreational jetty. A sturdy concrete and steel structure serves the fishing purpose quite well, but fails miserably as an iconic wooden/steel structure rusting and weathering in to oblivion, just like the old Rapid Bay Jetty which sits alongside. The old jetty, built originally in 1942, served its time as a means of transporting limestone from the nearby mine to ships. However mining ceased in 1991, and the jetty was left to nature, and failed beautifully. Broken in half and condemned, the jetty is now an iconic piece of texture, grain and rust, and in an unintended consequence has become a shady home for South Australia's own leafy seadragon. Continuing our journey south we pass numerous piles of tailings which have been poured over the natural cliffs during the mine's various lives. Underneath those tailings are natural cliffs, and these are some of the oldest in Australia. With geological formations similar to those in Brachina Gorge and Arkaroola, they are believed to be in excess of 600 million years old, and like many of those in the Flinders they are virtually vertical. Rapid Heads is our furthest point south, and there we are greeted by a pod of seals. Commonly known as New Zealand Fur Seals, but more recently named as Southern Seals, these mammals watch us from their rocky ledge perhaps with a degree of wonderment. After a short while, one of them decides to return to the safety of the water for an impromptu display of belly rolls, the occasional wave from a flipper and some more treats for those quick enough to get their cameras out. We head back to Rapid Bay beach for a short refuelling break before heading north in the early afternoon. The light winds give us a boost as we head past a mix of rocky outcrops, vertical cliffs and sheltered beaches. The seawall at Second Valley Beach beckons, but instead we gather in the water and look at the cave that is gushing with water. Taking turns, we are guided in to this sea cave where the peaceful serenity of a gentle cruise along the sea is overcome by a burst of darkness and tidal swells creating an unusual feeling of helplessness. Back out of the cave, and we travel a short distance to one of the beautiful and small beaches nestled between vertical cliffs. A ride on the swell to get ourselves under the rocky arch and on to the beach, where we are greeted by a boiling kettle, soft drinks and a cold meat and salad wrap that a number of fast food franchises would die for. After a short rest, and a push off through the incoming tidal swell, we head south back to our starting point at Rapid Bay. Upon cornering the final cliff and seeing the beach, our feelings of glee are dampened by the offshore winds that have either just started or that we had never noticed before. But following close to our guides, and close to the shore, we navigate that last 200m and bring our kayaks back to land. Rapid Bay is 110km (90 minutes) south of Adelaide on the road to Cape Jervis, just beyond the popular tourist towns of Yankalilla and Normanville. Adventure Kayaking SA operate six hour sea kayak tours from Rapid Bay with a launching schedule available on the Adventure Kayaking website or on their facebook page. The tours operate fortnightly during the warmer months, and typically on those days where kayakers can take advantage of the tidal movements. Kids and families are welcome, so what are you waiting for ? Congratulations on winning second prize. Looks fantastic Steve. Great pictures and write up. That secluded beach...never knew it existed...looks fantastic!